Capacitor Industries is comprised of 3 marketing divisions; Motor Capacitors, Inc., Chicago Condenser Corporation, and SEI Capacitors, Inc. Through the synergy of three companies, we have found efficiency and flexibility which have fueled our dynamic growth since 1990. With leadership and experience, Capacitor Industries is positioned to face the challenges and opportunities of today and into the future. Our headquarters is located just 15 minutes from Chicago’s O’Hare International Airport. Capacitor Industries is committed to providing our customers with Premium-Quality, High Performance products, Technical Expertise, and World-Class Customer Service. We have and will continue to grow by satisfying the requirements of our customers; quality-made capacitors, innovative designs, true customer service, and competitive prices. Motor Capacitors, Inc. was founded in 1990 to service the capacitor requirements of the Electric Motor Industry. 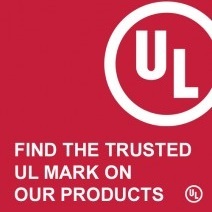 We offer our customers access to specialty and standard capacitor products. UL, CSA, VDE, TUV, and other agency approvals are available. Motor Capacitors maintains a very large inventory of metalized film capacitors ready for immediate shipment. Applications include health and fitness equipment, industrial blowers, refrigeration, centrifuges, water pumping systems, and power conditioning. Our products are produced in modern, high-volume, state-of-the-art manufacturing facilities. Each factory is ISO Certified, RoHS and REACH compliant, and operated by sophisticated management teams focused on worldwide growth. Manufacturing lead times are generally 2-3 weeks (not including shipping). Our shipping terms are FOB: Wood Dale, Illinois and standard payment terms are Net 30 days. A large inventory is maintained for our customers in our Wood Dale facility. We accept blanket orders and ship JIT, KANBAN, or against a release schedule. We provide custom designs, custom sizes, and customer-specified marking and packaging. We maintain a large inventory of performance quality capacitors at the lowest prices available. Chicago Condenser Corporation was founded in the mid-1940s and was acquired by Capacitor Industries in 1993. In the past 50+ years, Chicago Condenser Corporation has concentrated on high-voltage capacitors in general and those manufactured to military specifications in particular. Chicago Condenser Corporation manufactures a wide range of high voltage capacitors from 100 volts to 100,000 volts for DC, AC, and pulse discharge applications. 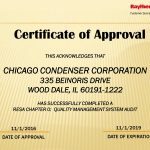 All Chicago Condenser Corporation products are made in U.S.A.
A substantial portion of our production is custom in that the capacitor is designed specifically to meet the electrical or mechanical needs of the customer. Applications include cardiac defibrillators, airport runway lighting, radio and TV transmitters, X-Ray, and scientific apparatus. High-voltage capacitors in both standard and a wide range of specialty designs, from 1,000 Volts to 100,000 Volts for DC, AC, and pulse discharge applications. Extremely small and lightweight, yet highly reliable capacitor used for the elimination of screen distortion in CRT’s and in the H.V. supply of photocopying equipment. Our dielectric systems utilize polypropylene and polyester films, Kraft paper, and capacitor-grade aluminum foil to achieve superior performance and long-life. All of our impregnating fluids are non-PCB and non-toxic. SEI Capacitors, Inc. was founded in 1961 and was acquired by Capacitor Industries in 1995. SEI Capacitors, Inc. manufactures metalized film capacitors for critical applications. High-speed winding machines allow us to wind polycarbonate, polypropylene, and polyester dielectric systems for capacitors requiring tolerances to +/- 0.25%. SEI Capacitors, Inc. has made a wide variety of capacitors over the years. A great amount of research has been performed to develop new manufacturing methods and materials best suited for the application. Applications include Aerospace and Avionics, Instrumentation, Industrial and Manufacturing Equipment, and Power Conditioning Systems. SEI Capacitors, Inc. also offers a full line of Aluminum Electrolytic capacitors for a wide variety of applications. We can provide voltage ratings to 550 VDC and also offer high-temperature and long-life versions on many of our standard products.